Urban beaches are a current fashion, but also an opportunity to enjoy at the best a visit to the most important European cities in the summer time. They have nothing on the sea coastlines, neverthless they offer lawns and sandy areas, sun lounges and beach umbrellas, bars and restaurants, music and live events, and the chance to play sports right in the heart of the city center. That is, all you usually search for in a sea beach, only surrounded by typical urban environments. 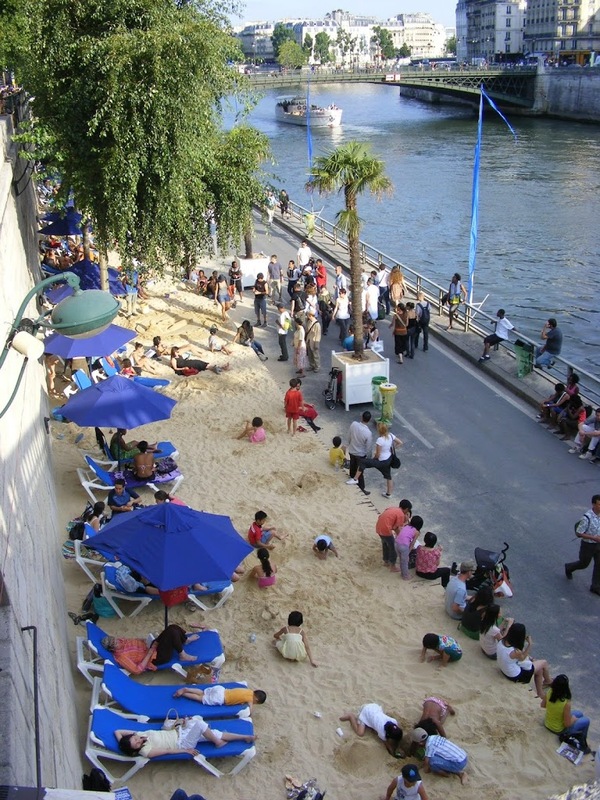 Paris Plages is the first “artificial” beach in Europe (2002): over 2,000 tons of sand with deckchairs and beach umbrellas, minipools, water sports, plus restaurants and snack bars where to have icecream or sip a drink relaxing in the sun. It is open in the evening as well, proposing cultural events and live music. 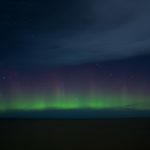 It stretches for 3 km along the Seine banks and is divided into 3 locations. The most popular beach is located on the right bank of the river, between Pont Neuf and Pont de Sully. The sandy beach, on the right bank, stretches along the so-called Voie Georges Pompidou. La Villette, northeast, from the Rotonde de Ledoux to the Magasins Généraux on Rue de Crimee, offers mainly water sports. Open 18 July – 21 August, from 8 am to midnight; free of charge, pets allowed. Swimming in the Seine is forbidden. For accommodation, you can view our best deals in Paris: we have a selection with over 1600 hotels. Berlin urban beaches on the Spree river are generally free of charge, and open every day from April/May to September, also in the evening. 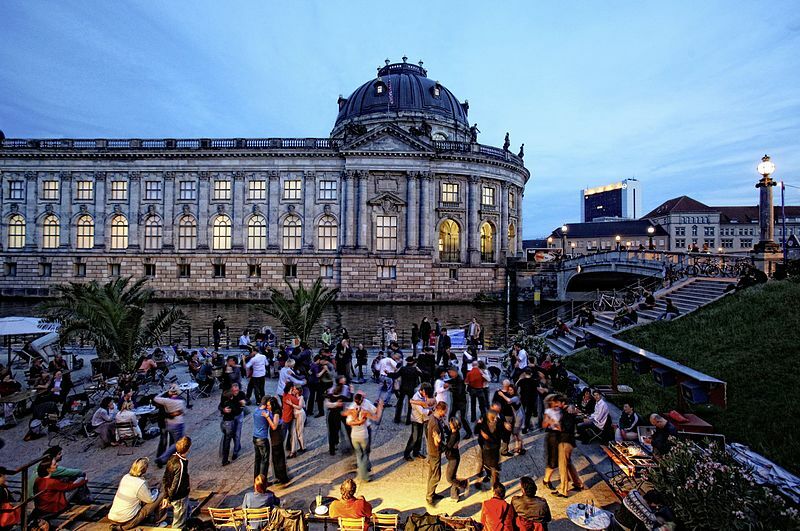 Strandbar Mitte (Bode Museum area) is the most popular one. It is the perfect place to have a drink admiring the city and the river banks. BundesPresseStrand is an elegant area with a pool, wooden tables and deckchairs. Traumstrand is a beautiful sandy beach close to the Hauptbahnhof. Oststrand (east Berlin) is the largest beach in Berlin: 7,000 square meters offering all you expect from a sea beach. Beach at the Box is a well-equipped sandy beach close to the Tiergarten (free entrance; free sun loungers after 25 € menu expense; reserved for gay people on Monday nights). Check out where you can sleep in Berlin. There are 4 spots where to enjoy the shy sun of Copenhagen’s Summer. 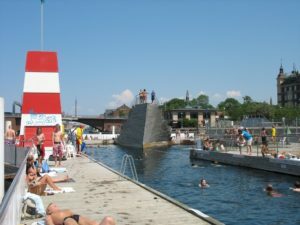 In Island Brygge Harbour Bath, located in the renovated industrial area, there are 5 swimming pools and 3 diving towers surrounded by the city’s buildings. Relax and fun are ensured also in the evening. Fiskeførvet Harbour Bath (free of charge) offers a children’s pool, a swimming pool and a diving one. Sluseholmen Harbour Bath (free) has 4 swimming pools and other sea-beach-like facilities. Sveanemølle Beach (free) is an open sandy beach in the Østenbro district, on Svanemølle Bay: 4,000 square meters of family-friendly beach and jogging-lovers promenade. Have look at our hotel deals in Copenhagen. Feeling the sand in your toes in the heart of London? Yes, it is possible! 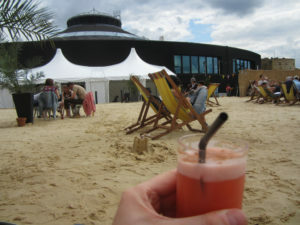 East Beach (Queen Elizabeth Olympic Park, Stratford; adults, £2, children £1) is the most popular city beach in London. It is something in between an amusement park and a sandy beach fully equipped with 2 paddling pools, bars, restaurants and a volleyball court. Camden Beach (free entry), on Round House’s roof, is the perfect place where to enjoy the sun, play some sports and have a BBQ with friends. Brixton Beach Boulevard (South London) is a bar surrounded by a beach, offering street food and music. Brent Cross Beach (North London) at the Brent Cross Shopping Center, offers sand, pools and a theme park. There is a sandy beach also within the Bishops Park (Fulham). Enjoy the Urban London Beach at the London’s Royal Docks in front of the Thames (entrance is free). You can view all our London hotels on this page. NEMO (open from June to September, from 11 to 19) is the most popular among Amsterdam’s urban beaches. 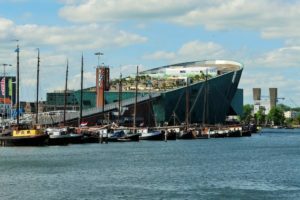 It is located on the terrace roof of the Ship-Museum of Science designed by Renzo Piano. Located in the heart of the city, surrounded by the canals, it offers a fascinating view and many facilities, both for adults and for children, to enjoy your beach-within-the-city experience. Amsterdam Roest (east Amsterdam) is a former industrial area that offers today a market and a sandy beach zone with bars and live music. Blijburg Beach is an artificial island perfectly organized to make you feel on holiday swimming is allowed. City Beach South is a trendy beach in the South (close to the RAI Congress Center). The terrace is covered during the winter. For sleeping matters, check here! 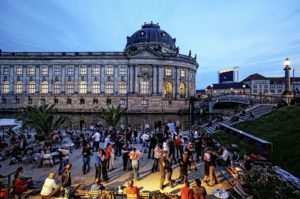 From Vienna’s urban beaches in the Danube Island you can observe the city from a different perspective, admiring the river and the buildings, sitting on a deck chair under a beach umbrella or refreshing in the floating swimming pool of the Badeschiff, a bar hosted in a boat. 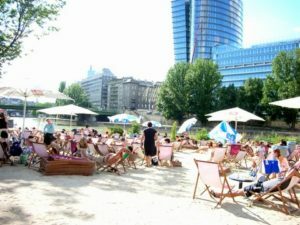 Strandbar Herrmann, close to St. Sthephen’s Cathedral, is a sandy beach located on the banks of the Danube canal, swarming with bars, restaurants and people during summer days and nights (open from April to October, from 10 to 2 am). At City Beach, in Schwedenplatz, you can have a drink in front of the Danube, dipping your feet in the sand and listening to music. In the urban landscape of this fascinating city, Žluté lázně is the largest beach in Prague. Placed on the east bank of the Moldova River, this sandy area features a swimming pool, football and volleyball grounds, many bars and restaurants, and live music. If you want to sleep in Prague, have a look at our best hotel offers in the Czech republic capital. And what about Italy? The most popular urban beach in Italy is in Florence. Easy Living, on the river Arno banks, is a 10,000 square meters green lung with a sandy area right in the heart of this wonderful Renaissance city. Here local people and tourists can have a moment of peace resting on a deck chair, walking down the river, having something to drink or to eat in one of the numerous bars and restaurants. It is also possible to play football and volleyball with friends. In the evening don’t miss a drink on the waterfront enjoying a musical background. For accommodation, you can rely on a wide selection of hotels. 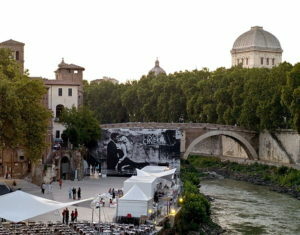 During the summer Tiberi Island, along the Tiber River, livens up giving the opportunity to relax down the river banks. This area offers bars, restaurants, live music and open-air theaters. 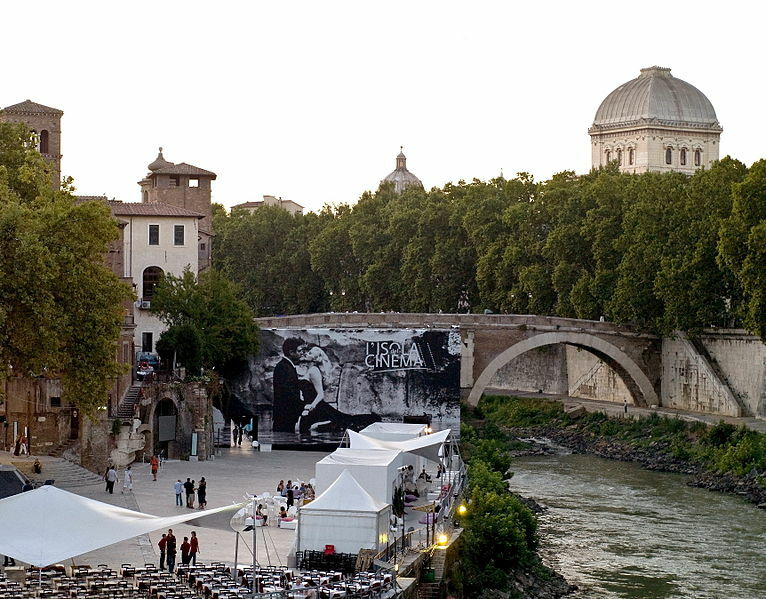 In general, several initiatives and cultural activities develop during the summer along the river around the city. The Italian capital offers over 1700 hotels to choose from. Milan proposes many places where to feel on holiday. Milano Lido (for a fee), in the western part of the city, offers a sandy beach and a swimming pool, ensuring both relax and fun. Milano Idroscalo, close to Linate Airport, is a big park around an artificial lake equipped with lawns, a beach, bathing waters, children playgrounds, areas for sport activities, picnic places and bars. Experience is the huge park born after Expo 2015. It offers a family area, a sport area, a relax area and a pet paradise. Activated in 2016, stay tuned to discover if it will also liven up 2017 summer holidays! Find your hotel and plan your visit to Milan. Beside architecture, museums and cultural life, many European cities offer real beach life in the heart of the city. 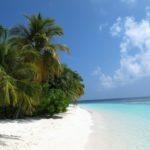 For local people zero-mile beaches represent the chance to be on holiday without going on holiday, to have a rest from the frenetic daily city life without moving. For tourists it’s a way to enjoy beach life and relax staying in their favourite cultural European capital cities.